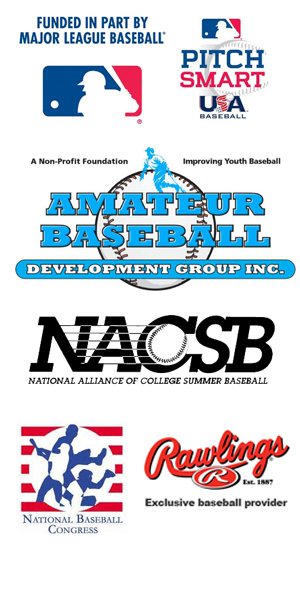 Clark Eder (San Diego St) struck out seven over the last five innings, Blayne Jones (Dallas Baptist) hit a two-out, bases-loaded three-run triple and Jack Kuzma (Cal Poly) drove in three runs on a pair of RBI-singles to lead the San Luis Obispo Blues to a 13-8 win over the Conejo Oaks tonight at Sinsheimer Park. Eder entered the game to begin the fifth inning in relief of Blues starting pitcher Peyton Sherlin (Dallas Baptist) with San Luis trailing 7-6 and completely dominated the rest of the game. He retired the side in order in each of his first four innings and then struck out three in the ninth inning to close out the win. He allowed only two batters to reach base out of the 17 he faced, Brandon Lewis (UC Irvine), who doubled off Eder with one out in the ninth inning, and Jordan McFarland (Arkansas), who drove Lewis in. Eder then struck out the last two batters of the game, finishing stronger than he started by striking out seven of the last nine outs he recorded. Brain Klein (Texas Tech) hit an RBI-single in the bottom of the fifth inning to tie the score and the Blues took their first lead of the game in the seventh when Jay Charleston (Tennessee) singled, advanced to third on a pair of wild pitches and scored on error, and the added five insurance runs in the eighth when Noah Taylor (Cal Poly) singled for the third time in the game and scored on a Kuzma single and, after a pair of walks loaded the bases, Jones hit his triple to drive in three and then he scored on a wild pitch. The Oaks had jumped out to an early 5-0 lead, scoring three times in the first inning on RBI-singles by Chase Cockrell (Ole Miss), Michael Spears (Ole Miss) and Drew Sims (Utah Valley), and twice in the second on an error and another Cockrell RBI-single. San Luis then rallied for five runs in the third inning to tie the score when the first three batters of the inning reached base on a single and two walks and Taylor hit an RBI-single, Kuzma drove in two with a single, Charleston singled in a run and an error let in another. Conejo took the lead again in their next at bat when Elijah Alexander (Rio Grande Valley) tripled in a run and scored on an error to make the score 7-5, but the Blues scored an unearned run in their half of the fourth inning to start their takeover of the game. The Arroyo Seco Saints took advantage of four walks, a hit batsmen and single to score three runs in the bottom of the ninth inning to beat the Orange County Riptide 15-14 tonight at Jackie Robinson Stadium. In the most literal example of a walk-off win, Bennett McCaskill (Dartmouth) drove in the winning run with one out in the ninth inning by drawing a five-pitch walk with the bases loaded. It was also totally uncharacteristic of the game as a whole as both teams pounded the ball, Orange County collecting 17 hits and Arroyo Seco collecting 16. The Saints had jumped out to an 8-0 lead in the first inning on seven hits, including RBI-doubles by Gabe Chavez (San Bernardino), who had a game-high four hits, Brennan McKenzie (Cal Poly Pomona), and Drew Cowley (Cal Poly Pomona), whose RBI-single was the only hit the Saints would get in the ninth inning. Colin King (Regis), who started on the mound for Arroyo Seco and struck out the side in the first inning, surrendered a single and a double to lead off the second inning, both of whom scored on RBI-groundballs to make the score 8-2, and, later, pitched a scoreless third and fourth inning before things started getting complicated in the fifth. In the meantime, the Saints added to their lead in the third inning when Chavez led off with his second double, Cameron Briggs (UC Davis) drove Chavez in with a single, and, after Cowley singled for the second of his three hits in the game, Tristan Peterson hit a three-run home run to put Arroyo Seco up 12-2. From then until the bottom of the ninth inning, however, all the scoring belonged to Orange County. The Riptide scored three runs in the fifth inning when Jake Ortega (Bakersfield) led off with a double and Bradley Jekich (Pacific) and Mason McWhorter (Georgia Southern) hit RBI-singles; once in the seventh on McWhorter’s third hit of the game; three times in the eighth on a two-run double by Paul Gomez (Missouri) and a sacrifice fly; and five times in the ninth when Ortega doubled again to drive in two, Jekich hit an RBI-single, Micah Pries (Pt. Loma) singled in a run and an error let in another to give Orange County their first lead of the game 14-12. That lead was short-lived, however, as the walk-off ninth inning station-to-station parade unfolded shortly thereafter. The Healdsburg Prune Packers pummeled the Southern California Catch today at Recreation Park, sweeping a doubleheader with scores of 11-0 and 21-3. 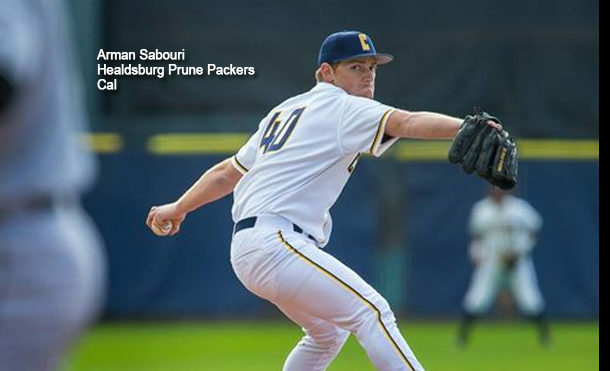 Ian Villers (Cal) and Arman Sabouri (Cal) combined to pitch a four-hit shutout in the first game today, striking out two and six batters, respectively, and getting all the run support they would need in the second inning when Sam Wezniak (Cal) hit an RBI-triple to put the Packers up 1-0. Villers, the starting pitcher, retired the first seven batters he faced before the Catch collected three singles in the third inning but failed to score. Sabouri relieved Villers to start the fourth inning and was even more stingy, allowing only one hit and retiring the last seven batters of the game, including three strikeouts in the ninth, to close out the win. The Packers didn’t pad their lead until their last two at bats, scoring two runs in the seventh inning and eight in the eighth in which Clay Koelzer (Texas Tech) batted twice and drove in three runs in the inning on an RBI-double and a two-run single, Jake McNichols (Santa Clara) hit a two-run double, and Kevin Sandri (Pacific) hit an RBI-single. Sam Reinertsen (Davidson College) struck out eight in four scoreless innings, Quentin Selma (Cal) hit a grand slam and a double, MacNichols hit a three-run home run and a two-run single, Luke Fegen (Indiana State) hit a three-run triple and Ben Sanderson (UCSB) hit two doubles and a single to highlight Healdsburg’s rout in the second game. Reinertsen’s four innings closed out the Packers’ win and featured strikeouts in every inning, including two in the seventh and eighth innings and all three outs in the ninth.